Our Most Controversial Post Yet? So...not sure if you all are aware of the phenom that is March Madness. It's a pretty obscure and not very well known event in the world of college hoops. In fact, you've probably never heard about it. So, if you don't know about it...no big deal. 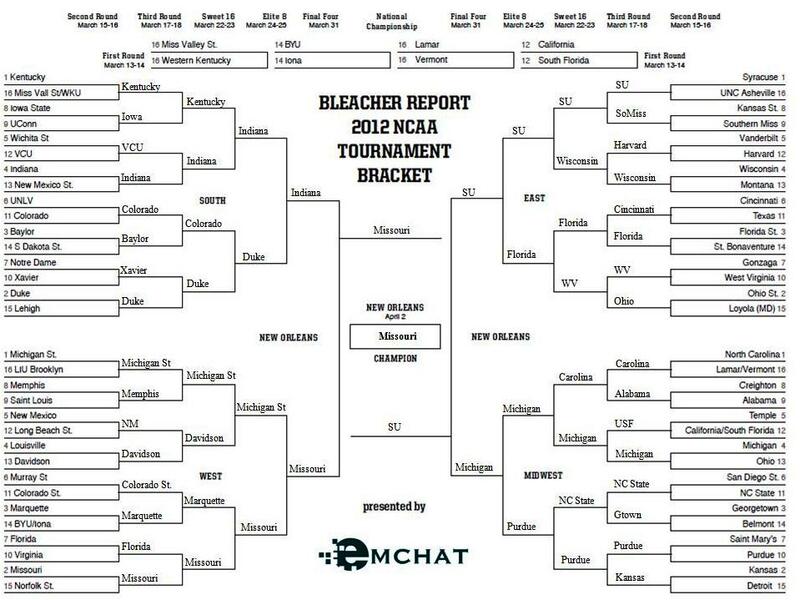 Nevertheless...here's my bracket a day late but still with plenty of time to spare! I played it pretty safe, but I know this season has potential for upsets all over the place. To be honest, I'm really not a huge follower but I love watching games when I get a chance -- don't beat up on me too hard. I'd also like to add in that I catch a women's game when I can, but I know far too little to even begin that one! What's your bracket looking like?